The Rare Stuff: Elvis Costello Trainspotter Gap-Plugger Extravaganza Part 1.5: Special St. Patrick's Day Edition! Elvis Costello Trainspotter Gap-Plugger Extravaganza Part 1.5: Special St. Patrick's Day Edition! It's been a week since I've posted anything here, and I don't have too much time tonight, so here's just a quickie pre-St. Patrick's Day 6-song Elvis Costello post. Not the 20-song batch which comprised our EC Trainspotter Gap-Plugger Part 1 post, so I've called this 1.5. Plenty more coming in parts 2 and 3, fret not! The MacManus Gang: A Town Called Big Nothing; 3 versions; 1987 single featuring Elvis' then-wife Cait O'Riordan, his dad Ross MacManus on trumpet, and Attractions Steve and Pete. Weird fake-spaghetti-western-soundtrack song, but Irish band name/members! All This Useless Beauty - Live from 6A: Great Musical Performances from Late Night with Conan O'Brien. Recorded May 21, 1996; w/Steve Nieve. O'Brien, he's Irish, right? Many Rivers to Cross - Brilliant Attractions cover of Jimmy Cliff classic from the Live for Ireland anti-heroin charity concert CD (actual concert title was Self-Aid) from 1986. Long Journey Home (Anthem) - Elvis Costello with Anuna. 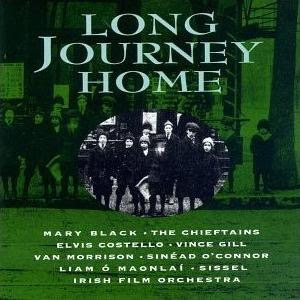 Co-written with Paddy Moloney of the Chieftains, this stirring anthem was the title song of a documentary celebrating Irish-American history. Jimmy Fallon recently sang a bit of this in harmony with Elvis on his recent appearance on Late Night; you can track it down at the show's section of NBC's website. Add this to your St. Pat's mix, and hoist a glass of Jameson's or Guinness and wave it to and fro. Happy St. Patrick's Day from The Rare Stuff! Aloha... I;m really enjoying the Costello "Gap Fillers" you have posted so far! A very big thank you for them, and I'm looking forward to parts 2 & 3 when you get to them. Thanks for the clarification, gahndalph!